January is a crazy time for the Berroco Design Team. From holidays to trade shows to the unveiling of our new yarns and designs for spring, there isn’t much downtime. It’s hectic, but it’s also a lot of fun. Norah, Amanda and I all headed to New York for Vogue Knitting Live last weekend and it was a whirlwind. In two days, Norah taught two classes, did a book signing and participated in a panel discussion on knitting culture. It was exhausting just watching her! Amanda and I took shifts covering the show – I headed home Saturday afternoon to attend my nephew’s birthday party and Amanda came to take a class on Sunday, so it worked out perfectly! 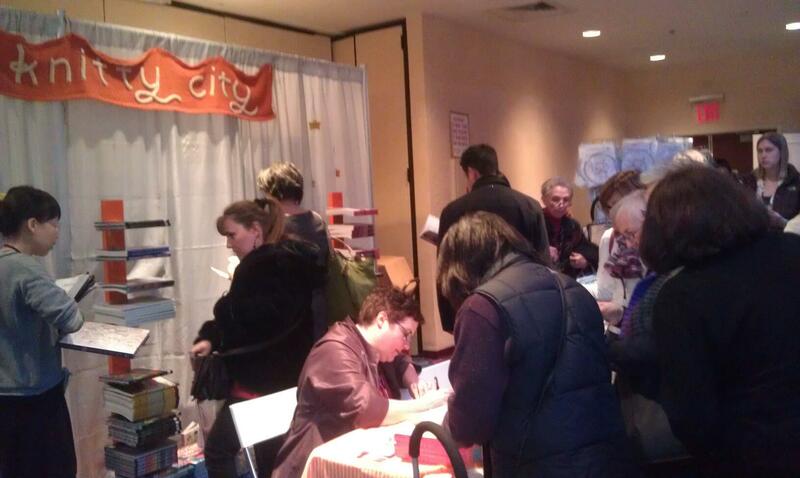 Norah signs books at the Knitty City booth. As a first timer, it was exciting and overwhelming. There was so much to see and do, and I had to fit it all in in less than 24 hours! One of my favorite parts was meeting so many different designers. I also loved the knitted food display created by our friends at Colorful Stitches. I know a lot of you couldn’t attend and some of you who did, like me, didn’t have time to do it all. So I put together a quick video of highlights from Norah’s cable class. Hope you like it! Want more to see more from our weekend at Vogue Knitting Live? You’ll find a photo album on our Facebook page and new pins on our “Spotted in the Wild” board. Oh, I wonder what the gorgeous pinky-coloured sweater with the sort of rippling cable design is at the 50 second mark? Sarah, I believe the sweater you’re talking about is Gullveig from Norah Gaughan Vol. 9: http://www.berroco.com/patterns/gullveig. Previous article Ask Amanda: I’m just completely stuck – what do I do?